Hope your holiday was good... no doubt I'll find out about it soon after you get back. 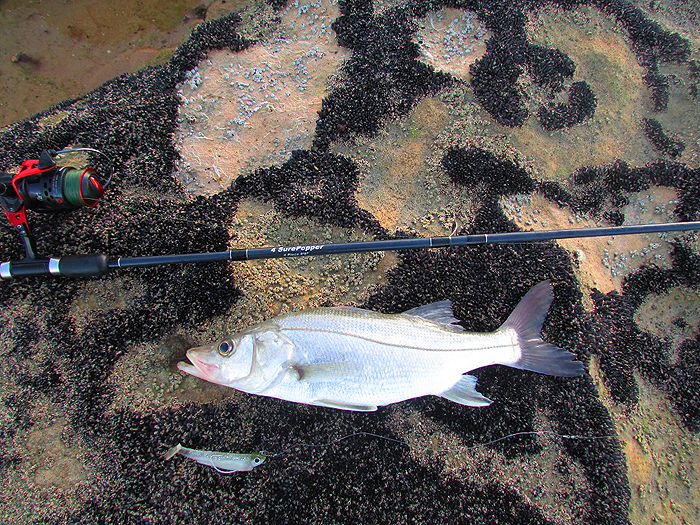 i. Baited spoon: been experimenting with baited spoon fishing at low tide. First time I got bitten off by a puffer fish, second trip produced 2 small lizardfish and the third trip more of the same. It's likely that the mullet aren't there or, at least, aren't there when I am fishing for them. Anyhow, the worst thing was I got stung by a jellyfish on my thigh just below my arse. It didn't hurt much at the time, but by the next day it looked like someone had tatooed a silhouette of a tentacle on my skin.... red, raised, and itching like hell. That was three days ago and the bloody thing still itches like mad. From now on I think I will wade in trousers or, at the least, keep some vinegar handy. ii. Kayak: Had a couple of goes in the kayak. No sign of the jacks. Had some sort of silver fish on for a few seconds... may have been a ladyfish or a barracuda. iii. Black minnows: Learnt how to replace black minnows... not as hard as it looks, but the head does have a tendency to slip down, even if you do it properly. I've tried supergluing it on, which helps, but doesn't last that long. iv. Mermaid beach. I've been twice. First time conditions looked great and after about 10 minutes a big yellow-finned back came out the water and engulfed my slandra. It took 20 yards of line and came off... bugger! Looked about 10lb. I fished on for another 10 minutes without a bite, then moved over the rocks and fished a slightly less weedy area with a black minnow. I almost instantly had a bite and after a short struggle landed a nice fat 3lb snook. I returned this morning but there was much more swell, although I did manage another bite as something had a pull at the slandra on the surface. Interestingly, both yesterday and today there was a lot of surface action and, on a couple of occasions something smashed a halfbeak on the surface. Not sure what's doing this... it's not very snooky behaviour so my guess is barracuda or jacks. Might be worth fishing a popper in some of the clear patches, though I expect weed would be a problem even there. Is there such a thing as a weedless popper? I think that's quite interesting stuff. I don't know of any 'weedless popper', perhaps there's scope for a bit of invention? Clearly there's also the poossibility of experiment with baited lures. I'm sure that it's just a matter of time until he latches into a monster snook again.